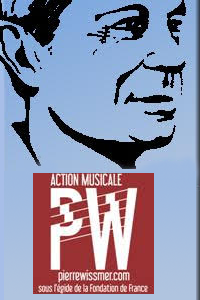 The Action Musicale Pierre Wissmer is an association whose goal is to develop knowledge ofthe works of composer Pierre Wissmer. This association does not act as an concert organiser and, in this way, accompanies projects undertaken by concert organisers. A professional musician, a concert organiser, a conductor or musical institution wishing to perform or have performed a work by Pierre Wissmer in the framework of a concert or a recording. The person submitting the dossier has ties with an organisation or an institutionholding a concert licence and able to issue an invoice. What information must be provided for filling out the dossier? A biography of the performer, the ensemble or the orchestra. It can be helpful to communicate a link that allows for accessing a video or a recording of themusician or the orchestra. The title of the work(s) chosen in Pierre Wissmer's catalogue. The date or period envisaged for the concert as well as the venue. The name and contact information (postal address, telephone and e-mail) of the personorganising the event. What sum can be sought? The amount of the subsidy is calculated according to all the real expenses. Written proof will be requested at the moment of submitting the dossier. The upper limit ofthe amount allocated is 20% of the costs engaged. The list of any other financing organisms as well as the amount allocated to the performance must also be mentioned. As an example, an established orchestra could request the sum of 3,000 € as well as payment for the hiring of scores in view of performing a symphonic work by the composer (N.B. this amount remains identical, even if the concert programme is repeated several times). In the framework of a chamber music concert, a concert organiser might request 500 € for the performance of two chamber works on the same programme. On what date must a dossier for request of aid be submitted? Dossiers must be submitted at latest by 15 December of each year for a subsidy the year after the following (e.g., for a subsidy in 2018, the dossier must be submitted by 15 December 2016). Applications will be studied at the annual general meeting which is held every year in early February. Dossiers arriving after the deadline or incomplete will not be considered. An acknowledgement of receipt will be sent to you. Following the Association's annual general meeting, every applicant will receive a letter informing him of the result. If the subsidy request is accepted, the project leader will receive an agreement for the dissemination of the works of Pierre Wissmer, which must be signed and returned to us. Our warm thanks for defending the work of Pierre Wissmer.